Discussion in 'The South' started by Castle, Oct 18, 2012. I remember at one time when there were lots of good folks posting in here about riding bicycles. I think everyone has their own spot on the net now I guess. I just figured I'd share I've been working on a legal riding opportunity down here. 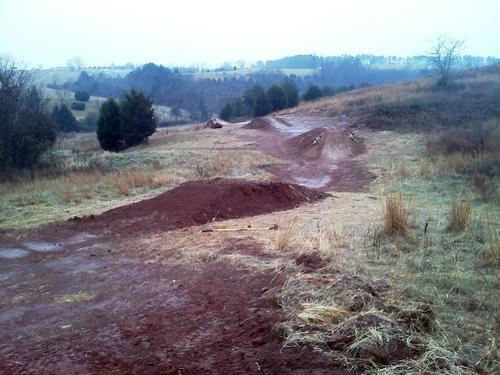 It's a jump line, if yall get bored over the winter and want to come ride. C'mon down/up whatever to Bedford Falling Creek Park. Been working on it little over a month now in my free time with the help of Bedford Trails and a few locals here and there. Not a big hill at all but should be a ton of fun to session when done. Daylight savings is here so it'll slow things down a bit. Here's a update. Looks like you're doing a great job bro! From what I hear...the line is ace! I can't wait to hit it up! Hey, that place looks pretty sweet! Hows the weather during the winter? 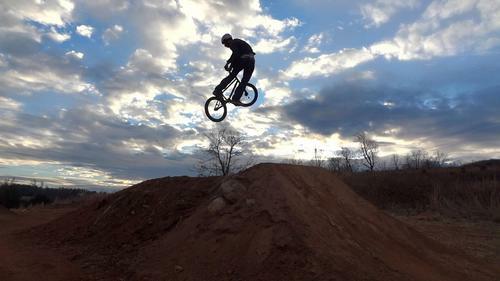 Are the trails open year round, including the downhill trail? Is the skatepark open to BMX bikes? Where is this magical place? We had nothing like this in Virginia Beach! Looks like a fun spot! Nice work. Follow the signs to the pump track. Once you park go over to the pump track make your way through the skills park and keep going to the edge and look down into the basin. There is now a set of bleachers sitting at the top of the hill facing down. Give me a shout if you want to come ride, love to meet some folks out there. No bikes allowed in the skate park, it's strictly enforced. bummer. There is a lot of fresh dirt out there, this will be it's first winter. It was super soft this passed Sunday the 16th. Haven't had to "close" the trail yet. It was basically not ride able on Sunday though. I'll be out again this afternoon. I expect it to be good and grippy. I'll be working though. The skate park is definitely not open to bikes. no fun. Police Station almost directly across the street too. You can go over to Liberty and they have a foam pit and park that is open to bikes. Checked out the video too. Nice work! If I manage to make it down from Crozet I'll send a PM. Thanks for sharing. Notorious BIL- if you are down for some carpooling, we could plan a trip to Bedford one weekend. I live in Staunton. I remember those days as well. They were good times. I like the trails you've built, they look awesome! Was that from Sherando? Got in over 10,000 feet if sweet singletrack descents last weekend at Douthat. Didn't see another soul on the trails outside of our group. I kind of like having the trails to myself. 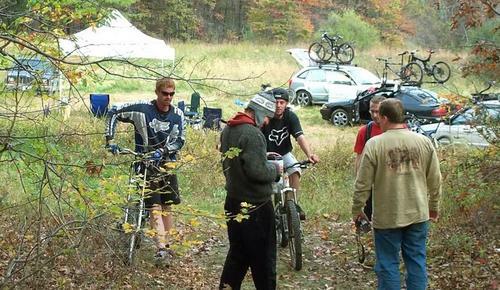 We rode Wintergreen and did some shuttle runs that weekend. I'm headed to Richmond this weekend.